Koilonychia is a symptom of anemia and/or iron deficiency. It needs to be caught quickly once the visual symptoms have shown. Granted, spoon nails can also be caused by worrying the edge of the nail, causing them to detach from the nail bed and curl up. However there are many ways that Koilonychia can be prevented. Wear protective covering on your hands while washing dishes or immersing your hands in liquid for a long period of time. Work with your doctor to identify the cause of your anemia and supplement your diet accordingly. Don’t eat or drink things that cause your system to shed iron, for instance, caffeinated beverages slow down iron absorption. Take vitamin C and Iron supplements to increase healthy nail growing capacity. Treatment usually consists of taking an iron supplement once or twice a day, and/or increasing the iron rich foods in the affected patient’s diet. The intestinal system may or may not allow the full absorption of the increased iron dosage, depending on the person. Doctors have noticed that a the beginning of an occurrence, it is most likely that the fungus lives along side the nail and gradually works its way underneath the nail to the nail bed as the infection progresses. Early symptoms of a fungal nail infection include a white or yellowish spot on the nail. As pain or discomfort are not common at this stage of infection, most people don’t notice the problem until it has progressed further. As the infection develops, things become a bit more noticeable, even if these changes happen slowly. 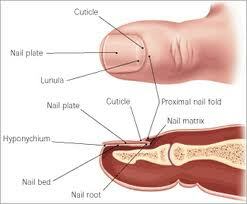 The nail dulls and gradually becomes yellowed and sometimes the toenail changes its shape. This is caused by the thickening of the nail and potential crumbling at the edges as it becomes more brittle and frail. The thick, yellowing, ridged nail is the trademark of the condition. This is when people tend to feel discomfort from the infection, sometimes caused by the nail separating from the nail bed. If you allow this condition to progress sufficiently that your toenail separates from the nail bed, exposing the soft skin below, it is possible that this can result in further, and more serious, infection. If you see pus oozing from your toe, or if there is a bad odor when you take off your sock, it is now time to go see your doctor, immediately. The myth about the toenail fungus microorganism is that it is only found in dirty places. Much like its cousin, the mushroom, this microorganism is happy to breed wherever and whenever it can. If its living conditions are correct, it will be there and will inevitably come into contact with hands and feet that it will send its spores onto to continue increasing the population. This is a fungus that everyone comes into contact with daily. Infection occurs when you give the fungus an environment in which it can thrive. The medical community refers to this particular fungus as dermatophytes. While there are other causes of nail fungus infection, including yeast and mold, dermatophytes are the most common culprit. It is unlikely that a fungal nail infection will become life threatening or debilitating. However they can cause pain and discomfort as well as affect a person’s self esteem because of the appearance of the nail. Because treating toenail fungus can be difficult, doing your best to prevent infection is the most effective cure. If you are concerned that you have an infected toenail, consult with your health care provider. Between the two of you, the state of your foot health can be determined and a course of action can be enacted. Every day we encounter many different microbes, microorganisms and bacterial. This is a normal part of life. Some of these turn out to be nail fungus spores. Most of the time, these are harmless as they are easily washed away. But if they manage to get into or under your nails, then they become problematic. When the spore gets itself into a warm, dark, moist place on your body (most commonly your nails because they have that extra benefit of being a good shield from the world) they are able to grow and multiply, causing that nasty look of yellowing and thickness everyone associates with a nail fungus infection. As the invasion by the fungus develops, so do the symptoms of nail fungus infection. The nail begins to become disfigured and can even get to the point where it crumbles or flakes away. This is most common in toenails because they spend so much time wrapped in socks and shoes, which creates a great breeding environment for the fungus. How Do I Treat a Nail Fungus Infection? • Good Nail Hygiene – Keep your nails short, right at the edge of the toe and clean out the underside with a nail file to ensure no dirt is able to permanently lodge there. Keep your feet clean and dry and air them as much as possible by not wearing closed shoes. • Vinegar – Soak your toes in a solution of vinegar and water, then wash and dry them thoroughly. The vinegar changes the pH of the growing environment, making it uninhabitable for the fungus. If you have tried these solutions, and/or some of the others out there and nothing seems to make the nail fungus infection go away permanently, your next step is to consult with your health care professional to find a more standard medical solution to the problem. Be aware that some of these prescription solutions do carry risks so be sure to discuss this with your doctor and to make your doctor aware of all medications your are currently taking. During your treatment, continue to practice good nail hygiene as this will encourage the healing process and help to prevent spreading or continued nail fungus infection of your toenails. Many solutions are available to treat this problem. Search the internet for alternatives before you commit yourself to taking an oral antifungal medication, especially if a child is the infected patient. If you do your research it will pay off in the long run. Doctors tend to shy away from the word “cure” when referring to toenail fungus because it is not an easy thing to do. We have become a very busy society that believes popping a pill will take care of everything. Unfortunately that is not the case with toenail fungus. Onychomycosis, the medical term for toenail fungus is hard to cure because the treatment regimen is very long and can be quite involved. Most kinds of fungus are able to lie dormant for a long period so people will go through treatment and get positive results, only to find that the infection returns. Curing toenail fungus permanently is a possibility, it just take work and patience. Several factors must be taken into account when examining your chances of curing toenail fungus. First is how far along your toenail fungal infection is. If you can catch it early, you stand a better chance of eliminating it entirely. As a fungal infection progresses, it goes from the skin surrounding the toenail into and under the toenail, where it becomes much harder to eradicate. Second is your own level of commitment. Treating toenail fungus is much more involved than just taking a pill. The idea is to create a hostile environment for the fungus so that they die off. This may involve washing your feet several times a day with a special soap and then donning clean socks each time. Yes, this is a lot of work (and extra laundry) but if you wish to control and end the toenail fungal infection, you will need to follow all of your doctor’s instructions as well as educate yourself on how to avoid recurrence. The most unfortunate part about curing toenail fungus is that the statistics are so out of whack on actual success because so many people get frustrated part way through their cure and give up, or they miss a day or two and get pushed back by two weeks. This negates the outcome of the studies that have been done, or at least makes the conclusion “unknown”. If you are going to treat your toenail fungus, you need to address all of the problems and be willing to put in the time and effort it will take to achieve a successful result. If you and your doctor decide that the oral prescription medication is the way to go, ask about helping the process along by using a natural topical antifungal like Tea Tree Oil as part of your healing regimen. Giving your body help from both the inside and the outside can work in your favor. The goal behind combining your efforts is to permanently eradicate the fungi living off of you. This combination of efforts will take effort on your part in maintaining a healthy for you/not healthy for the fungus environment. The biggest barrier to a cure for toenail fungus for most people is the amount of time and work that go into treatment of this disease. Washing your feet and applying medication 2-3 times a day as well as doing extra laundry to make sure your socks are clean and finding shoes that allow your feet to breath will become stressful. You must remember that missing one day of treatment will undo the last four you worked so hard on as it only takes the fungus one day to re-establish themselves. If you can stick to the program, with the help of your doctor, you can permanently end your toenail fungus problem. Toenail fungus is one of the most common and contractible diseases, as well as one of the most difficult to cure. The first thing you have to do is determine the cause of the infection. Is it fungal, bacterial, something else? And which kind of nail fungus is it? Is it Dermatophyte or yeast? Once your doctor has identified the source of the infection you can determine the course of treatment. Many people choose the home remedy path and find it very effective. Please note, if your nail fungus infection has reached the point where there is pain and/or drainage (oozing pus) you are well past the point where home remedies of any kind will work. If this is the case, you will need to find a standard medical solution to your problem. Home remedies really are effective, especially in treating toenail fungus. Many people consider alternative medicine to be “hippy dippy” or “out there” but something to consider is that only a couple hundred years ago, “alternative medicine” was the only medicine available. Many of the home remedies currently recommended are sometimes more effective than their standard medicine counterparts. Some of these methods might sound a bit off-the-wall, but the science behind them is quite sound. Many of the natural fungicides recommended and available on the market are faster acting than some oral prescriptions. Soaking your feet in vinegar may sound gross, not to mention smelly, but vinegar has been used for centuries as a powerful disinfectant. Again, these are remedies to be tried in the early stages of nail fungus infection. Once the toenail fungus has caused the nail to separate from the nail bed, immersing your feet in vinegar or Listerine will be very painful, very quickly. The modern medical community has created its own solutions to the problem of toenail fungus by producing various pharmaceutical products to treat the infection. If you have caught the infection early on, it is most likely that your doctor will prescribe a clear coat medicated nail polish. If the infection isn’t cleared up by this product, the next stage is to try an oral antifungal medication. This is a step that should only be taken while under the care of a medical professional as some of these products carry the risk of serious side effects and internal organ damage. You will have to check in with your doctor regularly if you choose this option, which does make it very expensive. You will also need to let your doctor know all medications, supplements and herbal remedies you are taking as this will reduce the possibility of a negative drug reaction during the course of your treatment. The best cure for toenail fungus infection is prevention and/or early detection. Most people don’t notice a toenail fungus infection until it has progressed fairly far along as this is not something that causes significant discomfort and as it is not a regularly exposed area, people aren’t that concerned about it. The sooner you act to kill the invading toenail fungus, the easier it will be to make their extermination permanent.